I haven’t knit in quite awhile even though I have a stash of yarn and plenty of needles. While perusing Pintrest the other day I saw a picture for a DIY of a Super Simple Knitted Bracelet, and inspiration struck! 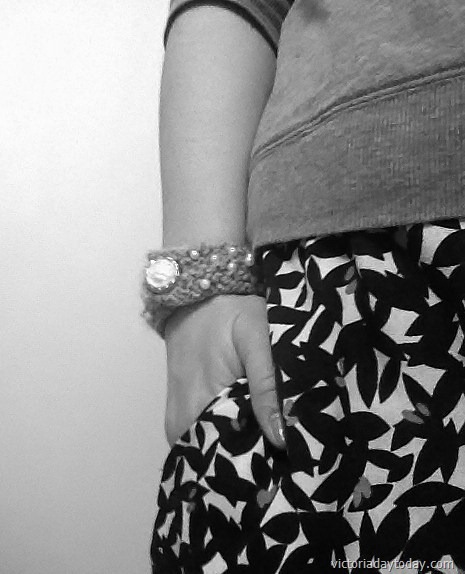 If you want to check out the bracelet I saw along with other fashion DIY’s on my Pintrest page click HERE. 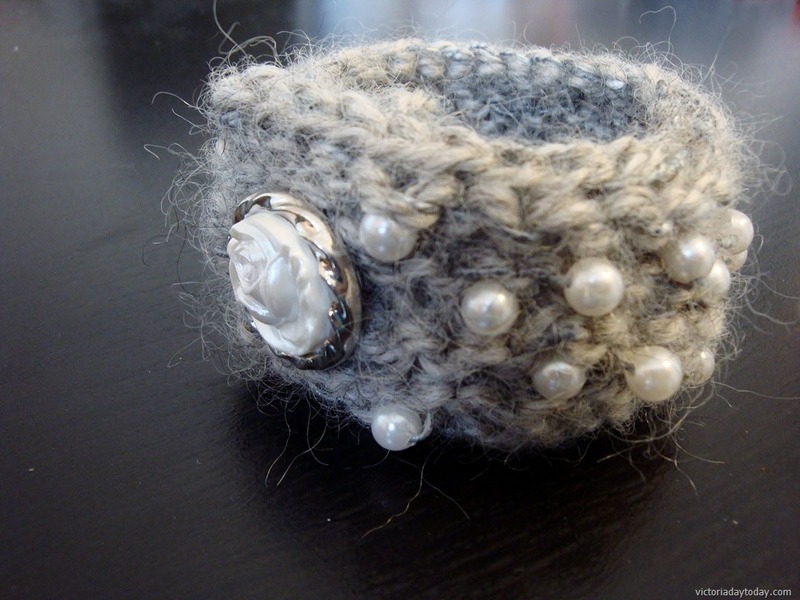 I still kept it simple by only using the basic garter stitch, which is where you knit every row, but used 2 weights of yarn to add the pearls and added a buttonhole. The materials I used and directions are below. 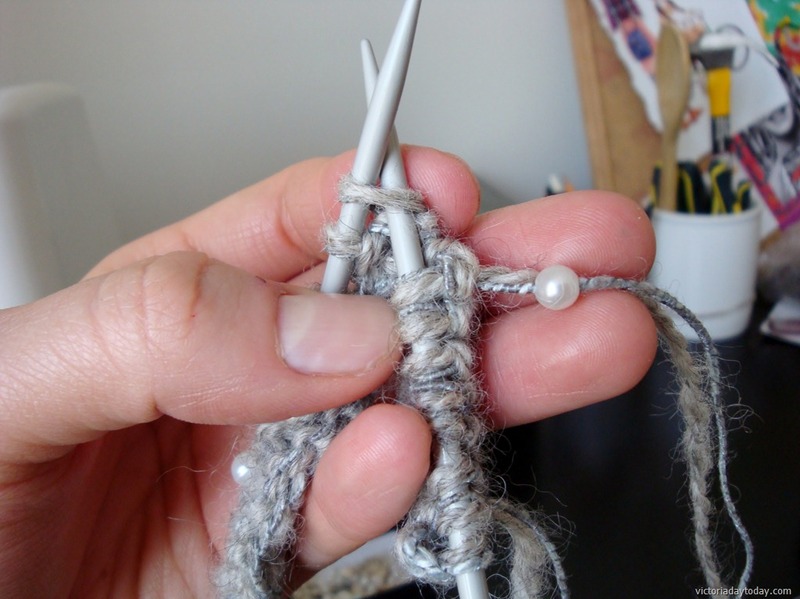 When choosing your yarns it is important that the yarn you pick is thin enough to fit through the needle that also is thin enough to fit through the pearls or beads your using. If you can’t find thin enough yarn embroidery floss would also work well! 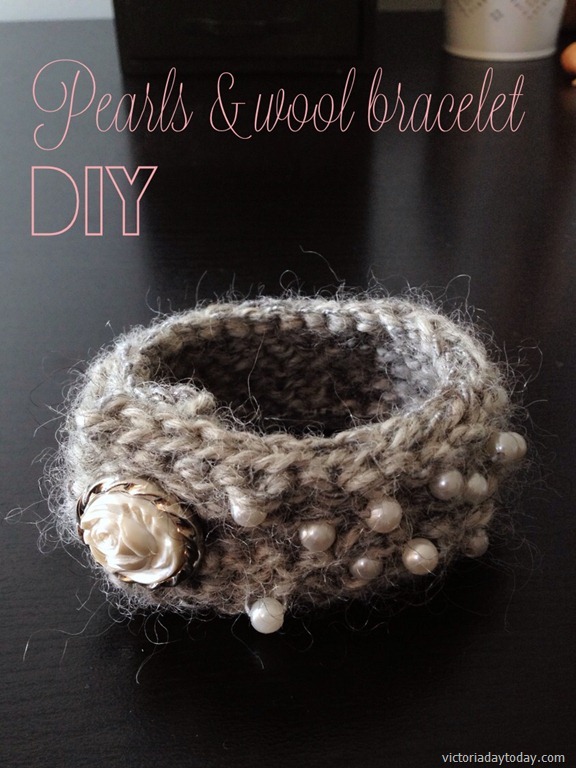 This is key because you need to string all the pearls onto the yarn before you start knitting. 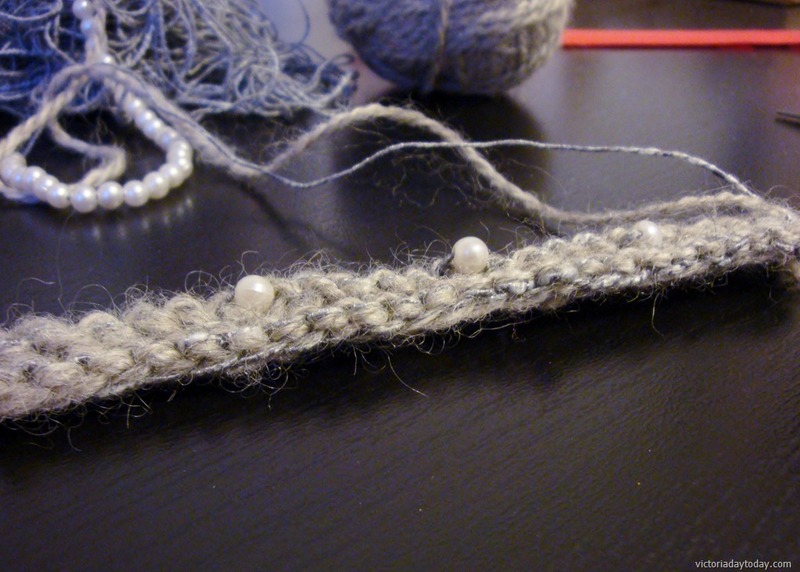 It is better to add too many pearls instead of too little because in order to add more you would have to break your yarn or start all over, not fun. 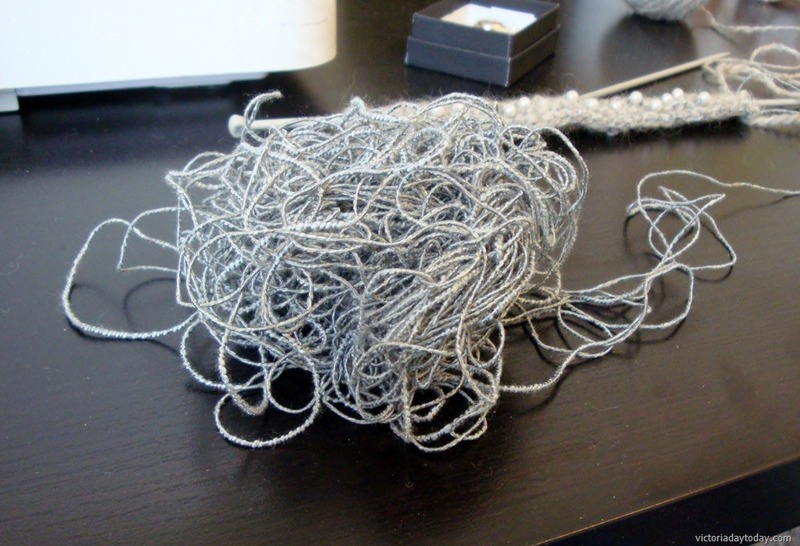 I threaded 40 pearls onto my yarn and pushed them down the length of yarn so I could have enough room to start knitting. Holding both pieces of yarn together cast on 40 stitches. If you feel like your wrist might be smaller or larger cast on what you think would fit. Remember that a button and buttonhole is being added so there will be some overlapping! Also when knitting with 2 threads of yarn I try to keep my tension a little looser then normal just to make it a bit easier on myself. You will always be holding the 2 strands together through this pattern. 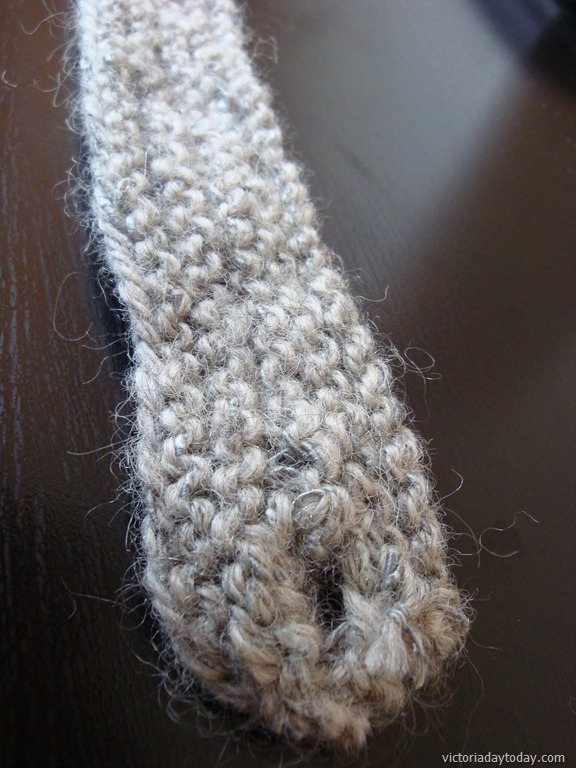 Row 2: knit 5 stitches, slide a peal up the length of yarn till it is at the needle. 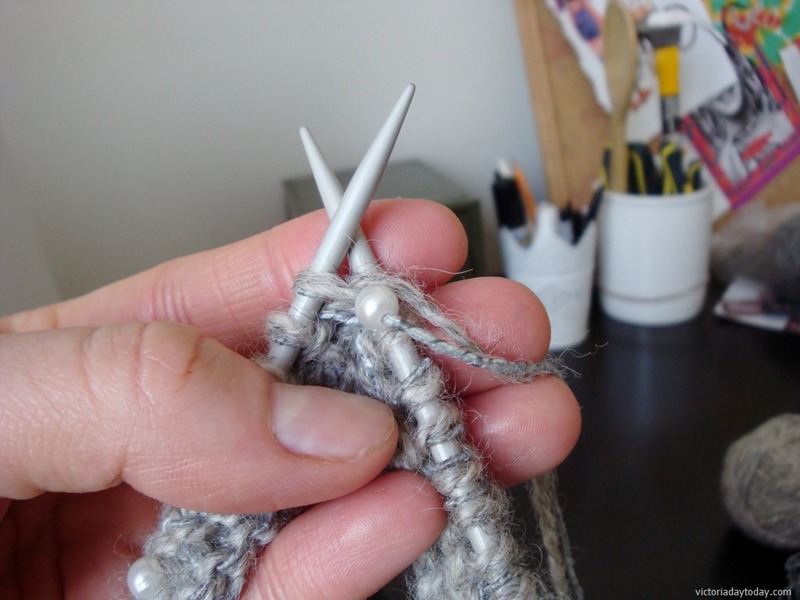 Knit your 6th stitch and as you bring the yarn around the needle bring the pearl with it. The pearl should be knit into your piece. Continue down the row knitting in a pearl every 5 stitches or so. 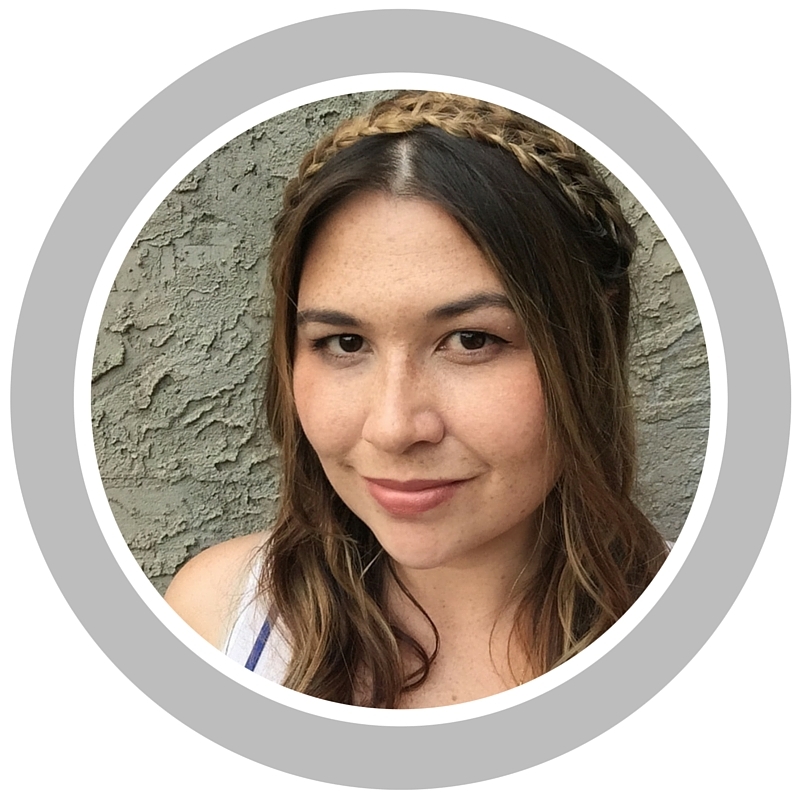 Add your last pearl on or before the 35th stitch and knit to the end. 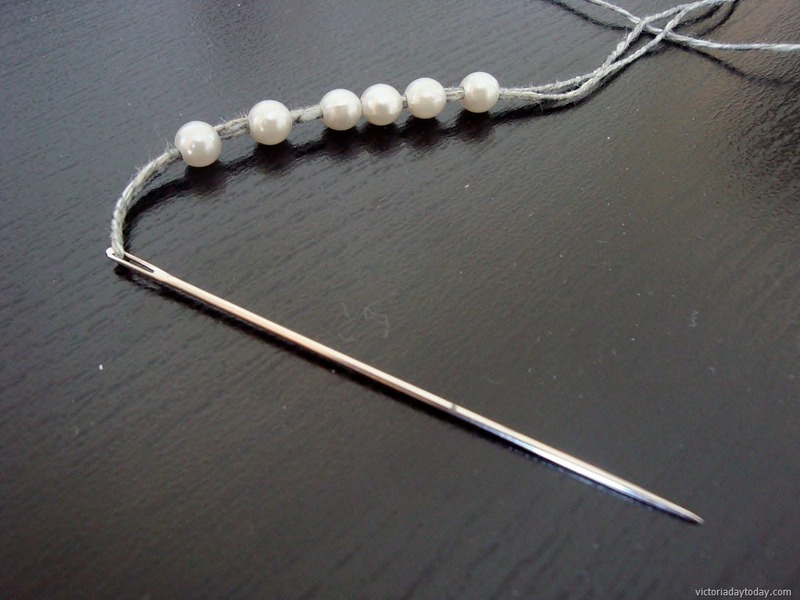 You need to leave 5 stitches at the beginning and end of each row without any pearls so you can add the buttonhole. Row 3: knit 10 stitches, add a pearl and continue to the end same as row 2. Doing this will stager the pearls so they are not all in a straight line. Row 4: knit 3 stitches then bind off 3 stitches. This will be your buttonhole! Continue down the row adding pearls. Row 5: knit like row 3 but when you get to the 3 stitches you bound off cast 3 on and knit to end. Row 6: Knit like row 2. Row 7: Knit, without any pearls. Bind off and weave you loose yarn ends into the piece. Your bracelet is almost done! If your buttonhole is a little wonky don’t worry! And if some of your pearls poked out the back you can just push them through to the other side, like I did. Here’s the back of the bracelet. Using some thread or the thinner yarn sew your button onto the side without the buttonhole. 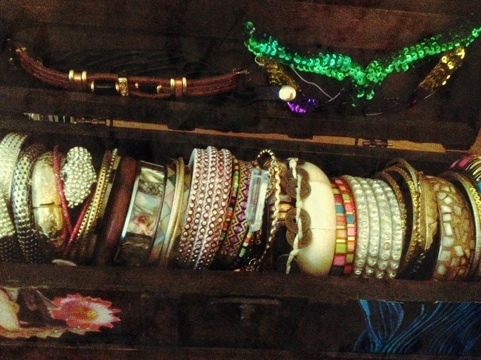 Now your beautiful bracelet is complete! 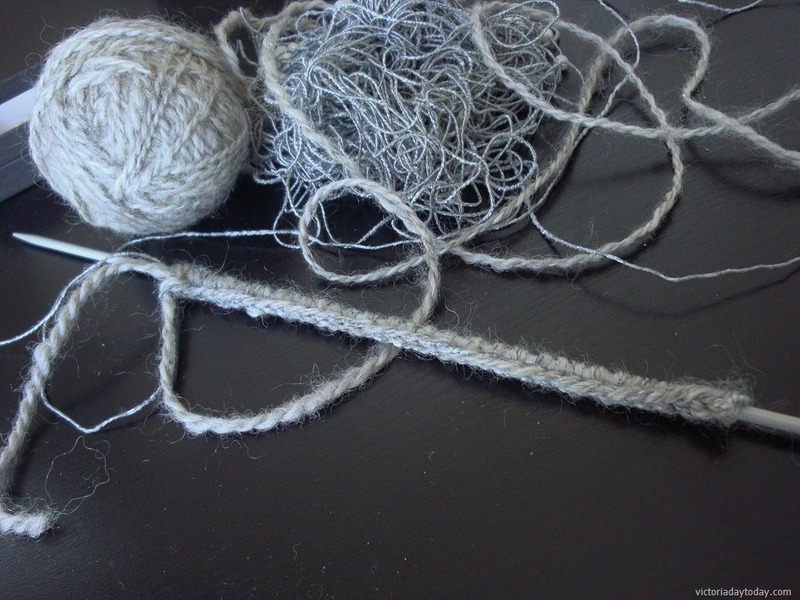 Here’s a little tip: Don’t do like I did and let one of your balls of yarn get all tangly. What a mess! 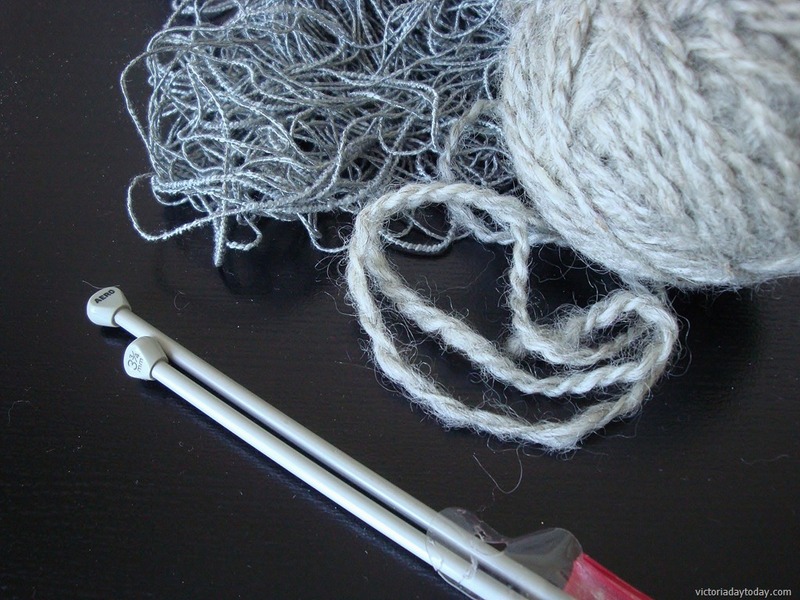 I will definitely be rolling my yarn into a ball before the start of the next project. sheesh. This is my first knitting tutorial so hopefully it is easy to understand. There are so many variations for this project. just using different yarn and buttons would give it another look. 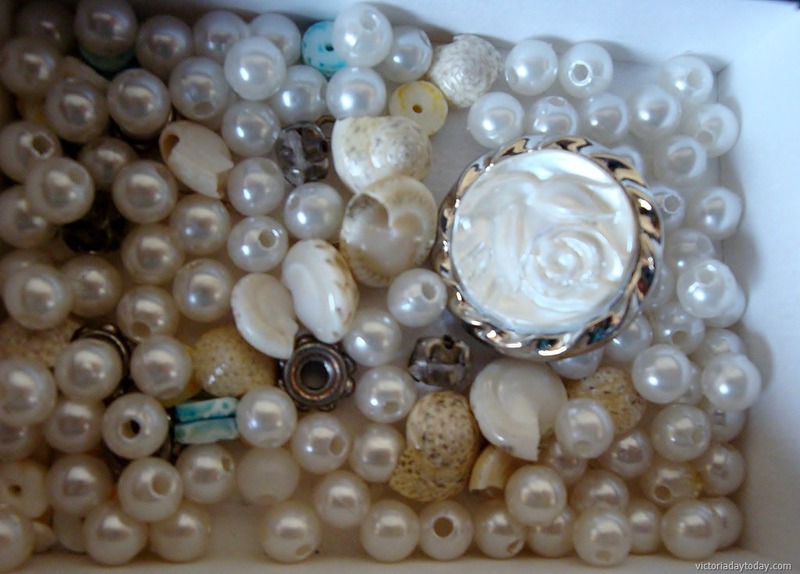 You could also use sequins or small shells instead of pearls! I just might have to make another!